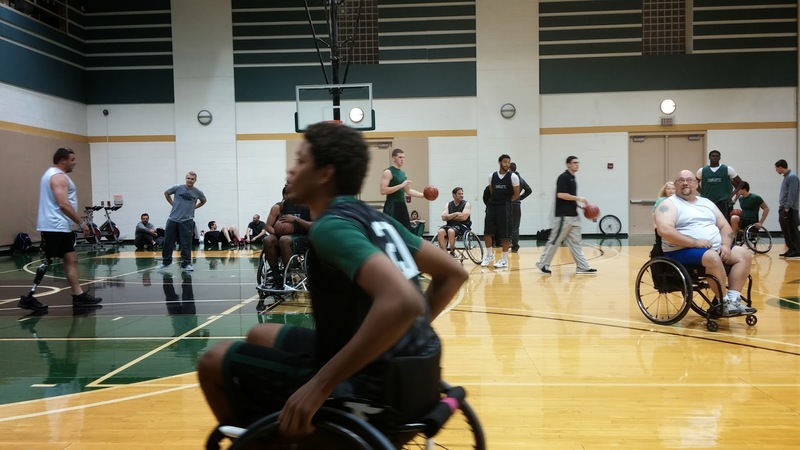 Carolina TarWheels: Practice with UNC - Charlotte 49ers! 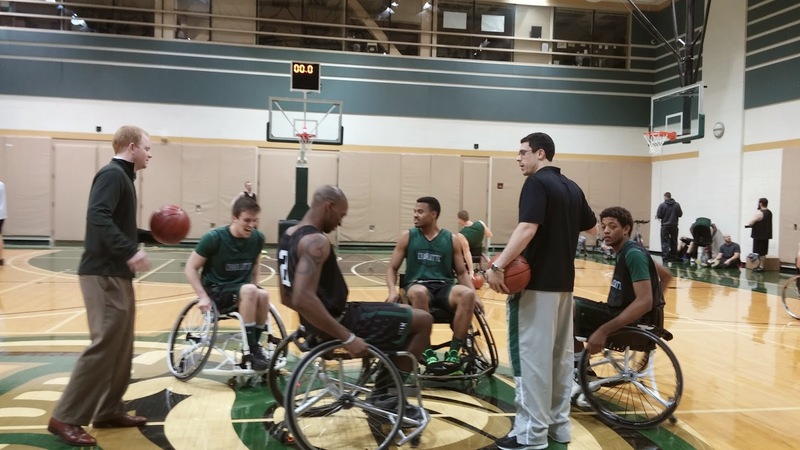 Practice with UNC - Charlotte 49ers! This week the TarWheels got quite the treat! 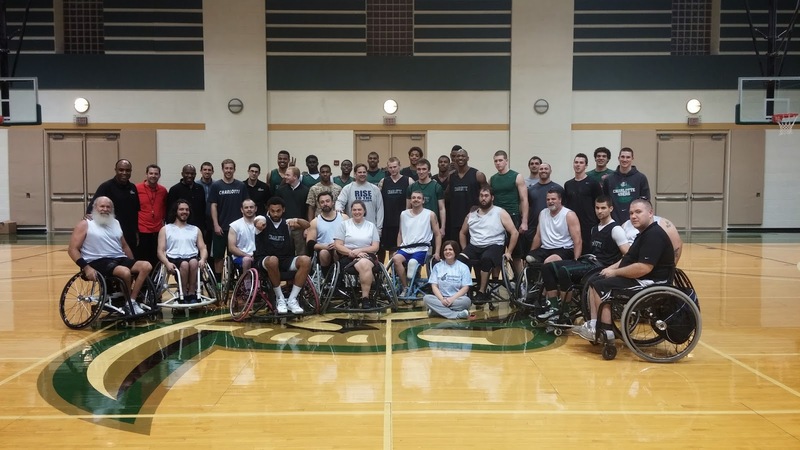 We were invited to come out and practice with the UNC - Charlotte 49ers men's basketball team! 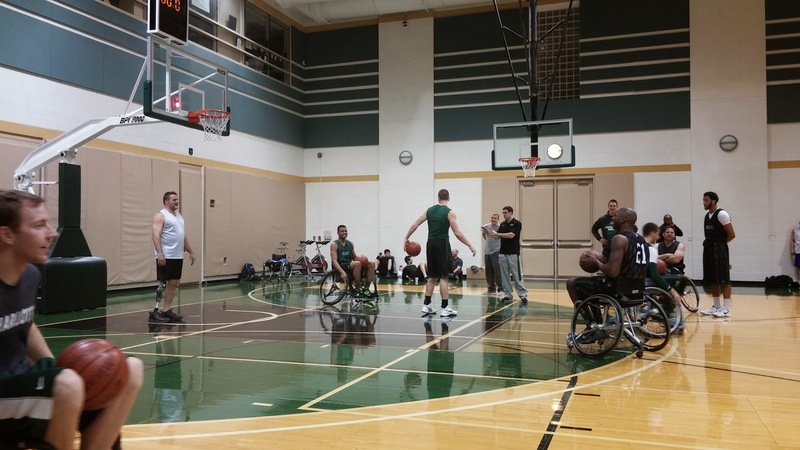 Just the thought of getting together with a college team and getting to share with them a little about wheelchair basketball was quite exciting. We didn't know what a great group of guys we were about to meet though! Coach Major and his staff did a quite a job of reflecting their own personalities in the players they've recruited! As we arrived for our non-traditional practice, we happened across the main court of Halton Arena. Seeing as how we'd be practicing with the basketball team, we figured they'd come out of the tunnel soon, so we started shooting around for a while right there in the middle of the arena! We were finally gathered up and taken back to the private practice gym! 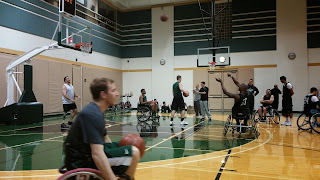 In a little more cozy atmosphere, we began shooting around, then on to our regular lay-up drills. The doors open, and those familiar faces we cheer for on t.v. started trickling into the gym. The UNCC guys gathered round, and watched us finish up shooting from the left, then the right side of our lay-ups. 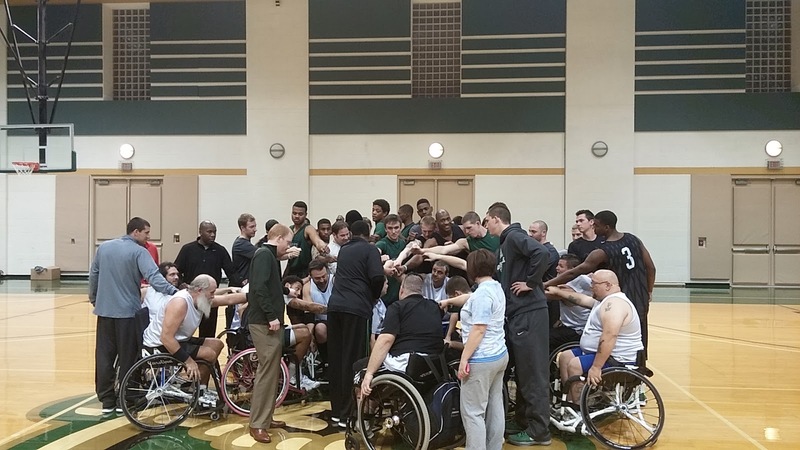 Coach Donnie Langford let his TarWheels finish up a little earlier than normal from the drill and we gathered at center court to meet the 49ers! These guys were great! They came right out, shaking our hands, eye's big and so enthusiastic about what they'd just seen! Coach Major gave the intro, and welcomed us to their house! For about 10 minutes, the TarWheels showed the 49ers how we play ball! 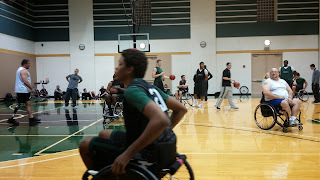 Our scrimmage against each other had all the normal calls coming from not only the TarWheels, but we could hear it from the sidelines as well! "Watch the middle", followed by some cheers of well for well placed passes or shots after cutting into the paint! You could tell they were enjoying the familiar, yet new, show! Then it was time for the 49ers to see things from a new level! The TarWheels would do the cheering, and maybe some laughing from the sidelines this time! 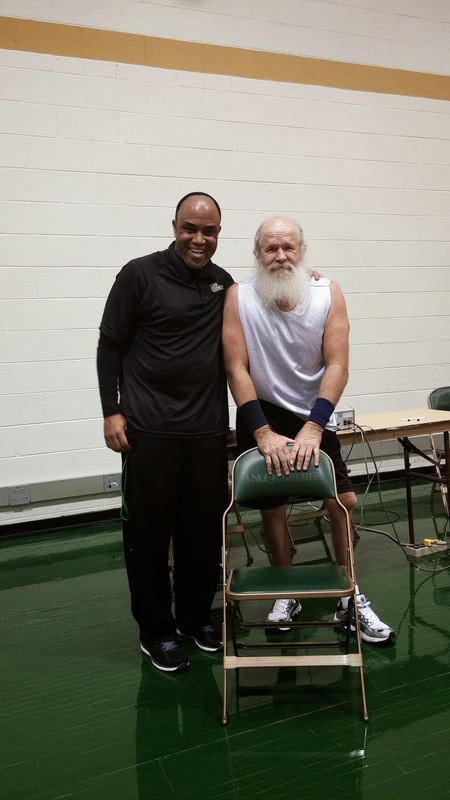 It's always entertaining watching someone try and figure out how they are going to dribble and get down the court in a chair. Actually, it's entertaining watching them just learn how to push the chair! To realize when a ball is a foot out of your reach, but stretching for it is only slowing you down can be counter intuitive. You've gotta push as long as you can before you make that catch! These guys were very impressive though, several of them were dribbling down the floor and pushing at the same time with pretty good speed. They figured out real quick that passing the ball would be helpful for them. 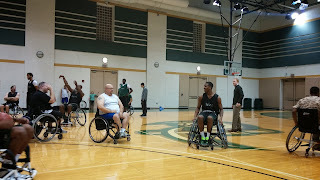 After they had some time to get a good feel for how to maneuver their chair, we took one of their teams off the court and put 5 players from the TarWheels on. A little scrimmage NWBA (National Wheelchair Basketball Association) meets NCAA style! 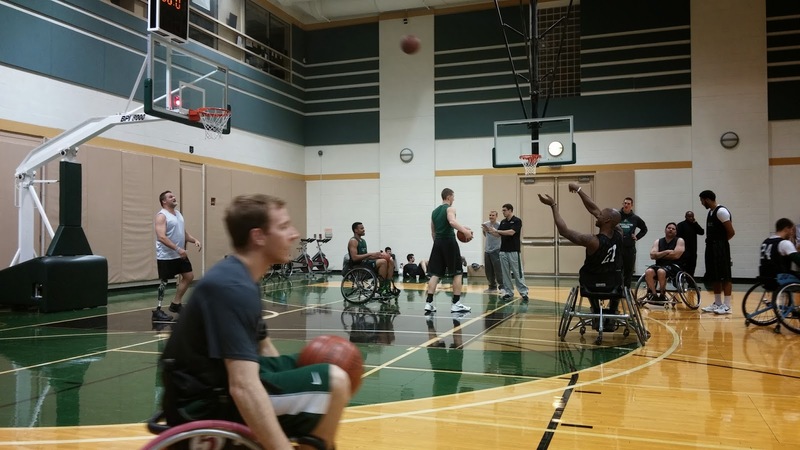 While the game seemed a little slow motion for the TarWheels, you had to admire the 49er players for keeping at it! We had a great time! 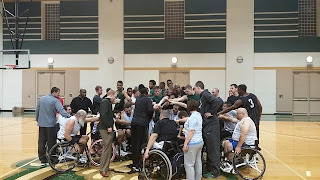 One last huddle to end practice with a "Niners" chant, and a great new friendship made! 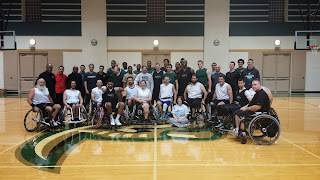 Thanks to UNCC's men's team for having us out! One last photo below of the two coaches! We can't wait to make it to one of the 49ers games and see in person the great year they're having already. ...Also looking forward to getting the 49ers to a TarWheels home game! There will be videos posted as soon as I can get this error message to go away! Check back soon, as the videos are really quite entertaining!